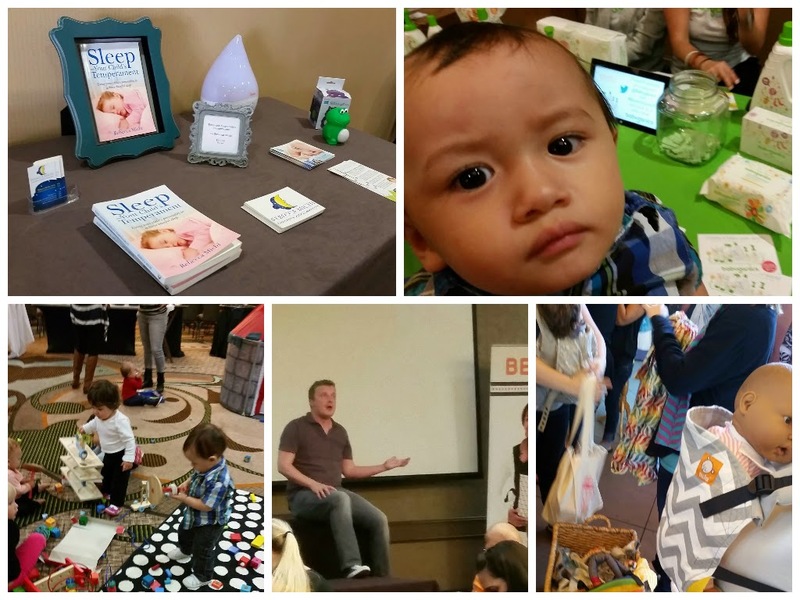 As someone who is active in no less than half a dozen mommy groups, most of which are focused around the more mainstream crunchy aspects of parenting, like babywearing, breastfeeding, cloth diapering and natural products, MommyCon Newport Beach was like walking into a room where my Mommy Facebook groups came to life. Actually, the moment I got out of my car, Baby Buckshot and I ran into two mamas from Socal Babywearers that I instantly recognized. Instead of Caw-Cawing (the official call of one SoCal Babywearer to another), however, I went ahead and introduced myself. And much of the rest of MommyCon was like that. Running into mamas I knew from my groups or talking to mamas who were in my groups but I had never talked to before. I had found my tribe! Here are some highlights, as I didn't make it to MommyCon in time for anything before 11am, I missed Babywearing Yoga AND Babywearing 101! If baby is having a hard time transitioning or staying asleep in a crib or pack-n-play, it is possibly the mattress or a comfort issue. Many times, crib mattresses are not as soft or cushioned as the parent's bed so changing to a softer mattress might help. She also explained that pack-n-plays are not really made for sleeping so they are not very comfortable for babies. She recommended MamaDoo Mattress Topper for parents who want to continue using the pack-n-play in lieu of a crib or co-sleeping. As babies transition through sleep phases, reducing from multiple naps down to 1 or 2 a day, she explained that to keep babies sleep schedules on track, it is both helpful and not detrimental, to wake a sleeping baby. Shortening, specifically, the second nap of the day, to a 15-30 minute nap can help baby get on track for a sleep schedule. My problem, of BB not staying asleep for longer than 2-3 hours at a time at night, and needing to nurse back to sleep was addressed in depth, lucky for me! Against everything I have read about babies BB's age, Rebecca noted that many babies still do wake from hunger and that this frequency of awaking is completely normal. However, BB is using nursing as a sleep crutch so it would be important to teach him to put himself back to sleep. She recommended that, while I can continue to nurse him at the beginning of the night and for a middle of the night feed, the lights should be dimly on to communicate that nursing is awake time. Then for the other night wakings, to sooth him to sleep without nursing. In her experience, it only takes 3 nights for a new sleep habit to be learned making a long weekend the perfect time to teach a new sleep lesson. There were so many vendors giving away such great stuff at this event. The best two items were Kinde Twist Starter Kits and with my Project: Breastfeeding add-on, Beco Soliel baby carriers! WeanGreen gave away Glass baby food containers, a Mam bottle, a Zen Rock teething necklace and a Diono Screenshade were included in the swag bags from Cottonbabies as well as lots of coupons. The swag included for the attendees more than covered the cost of a ticket. Score! In the breastfeeding lounge, there were also complimentary Milkin' Cookies and water for all the mamas. And those cookies were SO good. Toddlers are wired to reject foods that are in the slightest bit bitter or sour as a survival mechanism. In nature, typically when something is bitter or sour, it is a warning that it is not safe to eat. Familiarity will cause a child to enjoy a food. Repeated offerings of one bite in 7-12 different instances from a trusted source, like mommy, daddy or other regular caregiver, gives baby the exposure and understanding that a food is both safe and eventually enjoyable. Pregnant women who eat something, like carrots, at least 12 times during pregnancy, are likely to have children that immediately like that food item when first trying it. In utero, baby has more tastebuds than any other time in life, so baby can remember the flavor from the womb and in turn already registers it as familiar when having first solids. Heroes endorsing foods make children more likely to eat them. For instance, a container of cherry tomatoes, with a sticker of Elmo on it, may result in a child being more willing to try and like the tomatoes. Early exposure to real food textures in various forms is important. It was found that because children were more exposed to tomato purees, they liked the flavor of tomatoes but often rejected fresh tomatoes because they were only used to the tomatoes in pureed form and didn't like the fresh texture. Growing vegetables from a seed makes a child much more likely to love that vegetable. Getting a child involved in the harvesting, picking or preparation of a vegetable, exponentially increases the likelihood that they will enjoy the food. If a toddler is having a hard time even trying one bite of a new food, mix the item with flavors they already find familiar and enjoy. For instance, if the child enjoys marinara sauce but is rejecting broccoli, cover the broccoli with marinara sauce. Toddlers like to refuse things they are given but offering limited options, like asking them if they would like an apple or a banana, gives them the illusion of control making them less likely to protest what they are being given to eat. When I first saw Jaime Lynne Grumet, at MommyCon, she was wearing this gorgeous puffy skirted dress and a very high heels with her hair and make-up done to a tee. I couldn't believe that she was a mom, and if she was, she must have been a model/celebrity. Little did I know, she's actually one of the most famous moms from the cover of Time Magazine. She, the accidental face of Attachment Parenting mothers everywhere, along with Dr. Jay Gordon, spoke on a number of AP topics from how much protein do kids need (answer: don't worry about protein, feed them more vegetables), extended breastfeeding and answered much of the audience's questions. A lot of moms hire a professional photographer to commemorate their breastfeeding days. I considered that but when the Project: Breastfeeding add-on ticket went live, I immediately jumped at the chance. Get my breastfeeding picture taken by a famous photographer while also helping to destigmatize breastfeeding? That's a win-win. Hector was simply amazing to work with, infinitely patient as Baby Buckshot all of sudden was more interested in playing than nursing (the children's play area was right next to the Project: Breastfeeding area.) We had to come back a few times before BB settled down and started to nurse while I was sitting on the chair. By that time, I was a tired mess and BB would only settle in one position. For a minute, I felt really self conscious and put a fake smile on and was disappointed that my picture probably wouldn't turn out very pretty. But, given my 13 months of breastfeeding, me being a tired mess catering to BB in whatever fashion I could take care his needs, is probably the most honest picture of our journey. It was also a pleasure hearing about Hector's experience with the project. From taking a picture of a mom's last time breastfeeding her child, to capturing some moms breastfeeding babies multiple times, first nursing little squish babies and now as toddlers. I cannot express how much I love this project and look forward to seeing my less than perfect but actually quite accurate picture. This was the mecca of babywearing. From various wraps to soft structured carriers of all ergonomic makers, the babywearing educators and representatives from Beco and Ergo provided a very comprehensive picture of what today's babywearing world has to offer. Yes, that is Jamie Grayson, aka theBabyGuyNYC, in the center. I did not realize it was him when I was trying to get a panoramic picture. Looking back, he probably thought I was being a creeper taking his picture and not asking first! Ooops! Sorry Jamie! I also have to note that this event is just babywearing heaven. The Tula Wrap Conversions and gorgeous woven wraps all the mamas were wearing their babies in was better than a fashion show. ETLA, Meeyoo, Pavos, Giras abound. It was a real life Stash Shot Saturday! MommyCon was a great experience! Highly recommended for expectant mothers or those who have children toddler age or younger.